How about staying a few nights in different places. We've actually found that we can fly in for a camping trip easily - we each check one bag of clothes & stuff, then a big duffel with tent/sleeping bags/sleeping pads, and a cooler filler with misc. other stuff. A quick trip to Wal-Mart and the grocery store after arrival and you're done! Re: Death Valley - please, I need help! I always feel I can help people more if I knew what the really like from a vacation. 1. I like Panamint Springs for one or two night. Jerry hires real people and the food is good for DV. 2. I like Shoshone for a few days. The pool is the best around and people are friendly. I never get to stay in Shoshone enough. 3. Beatty has things to do after dark. Since I like to make my days as long as I can when on vacation, I try to stay up late. If I was looking at a week long home base I would use Beatty. 4. Furnace Creek keeps you close to alot of stuff in DV, it great to walk around in the evenings, and the rooms ar good for DV. The outfit that runs the place has odd hiring standards if you ask me, but I like the place. I sure could'nt hang out here for a week. Like others have said, stay at a different place every few days. andreae wrote: I have done some research and I have noticed that the 2wd (rental) is much less expensive than 4wd. Oh-well quess it carved in stone now, hope my posting made sense. I hope you are well aware of the summer heat! If you try any hikes, carry AND DRINK LOTS of water! A number of people died just this past summer, most of them trying to hike to the Mesquite Dunes (aka the Death Valley Dunes or the Stovepipe Wells Dunes). Please talk to the rangers about conditions before getting away from the pavement. Last edited by Older Fossil on Wed Jan 22, 2003 4:50 pm, edited 1 time in total. Good point Fossil, I didn't even see the word "Summer" till you pointed it out. For a 1st timer I would say, Do a tour with some outfit. If you plan to go solo, DO NOT LEAVE the PAVEMENT. Forget hiking. If the weather is normal this summer, its real hot & dry even on the cool days. SteveS wrote: If you plan to go solo, DO NOT LEAVE the PAVEMENT. I'm not sure I would be quite so absolute. Places like Titus Canyon and Racetrack would be okay to go to - always pretty highly traveled. I would definitely avoid places that are off the normal tourist traill. I would be that absolute. I been to the Racetrack in summer and have not seen a soul on any of the roads around. Up till the last few years Titus Canyon was closed in summer, and could be again. I don't think anyone should be traveling around DV in summer, in a rental car, solo. How many people have you seen at the racetrack in summer? I was there last july and we where the only ones there, and that was a saturday. To hot to hike in the Summer?? What are you guys talking about?? Titus Canyon (when open) and the Racetrack Valley Rd are regularly patrolled by DVNP, I just don't think you can get into too much trouble, and those are sites to be seen when discovering DV. I wouldn't recommend doing it in a low clearance vehicle, but high clearance 2WD with decent tires should be fine. Also, always possible to connect with other people staying at the same hotel so that you don't just rely on one vehicle. We tend to go much further into the Outback, sometimes single vehicle - but also take enough provisions for 10-14 days. The most I've ever had to walk out is ~20 miles, that was a long day. . .
Pugsly wrote: We tend to go much further into the Outback, sometimes single vehicle - but also take enough provisions for 10-14 days. The most I've ever had to walk out is ~20 miles, that was a long day. . .
BTW- Are you Einstein's owner? If so, how many times have you watched Back To The Future? The 20 mile walk was before I learned to carry 2 spares. By a stroke of genius I managed to shred two sidewalls on the same rock. It was a small, inconspicuous rock, but it was the perfect height to neatly tear through both sidewalls on my passenger side. Yes, Einstein is our dog, a big Irish Wolfhound. SteveS wrote: How come the quotes I used didn't highlite? Probably you have deleted "quote" tags. Those are the one in brackets. You can use the "quote" button and quote tag will appear. When you finish quoting, just click the "close tags"
SteveS wrote: Where is the "Edit button" that was all over the posting just a little while ago? I need to edit the quotes. There was a bug in the script and I had to remove edit function temporarily. NK4U and you Steve, made me work whole night to locate in eliminate nasty bug. Its all working now, and you can use the "edit button". Last edited by Bighorn on Wed Jan 22, 2003 4:26 pm, edited 1 time in total. As far as summer heat goes, it can be dangerous, if people are foolish to disregard NP advisory and common sense. They are far more fatalities in other known and popular parks, i.e. Yosemite (although for different reasons). 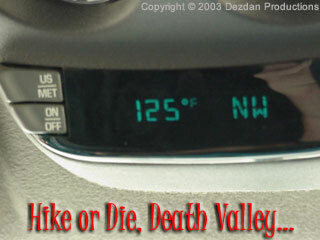 More people die coming and leaving (road accidents) Death Valley NP, than in the park itself. Of course, that doesn't mean, that danger should be taken lightly. Just take care, you know where are you going and be ready for unexpected. We have whole section dedicated to desert survival. Read it! When good feet go bad. bighorn wrote: NK4U and you Steve, made me work whole night to locate in eliminate nasty bug. Its all working now, and you can use the "edit button". Woo-hoo!! . Sorry about the extra hours you put in, but I can't thank you enough!! My foot was beginning to taste, well, rather unsavory. Hey look, everybody...NoKarma's posting on-topic! I can't help but notice that the 2003 edition of the Death Valley National Park Visitor's Guide contains an account of "Ingrid & Gerhard" on page 3. Gerhard, of course, was the visitor who recently decided to hike up Golden Canyon to Zabriskie Point in the paltry 110+ degree heat. Of course within just a few hours of beginning his "1/2 hour hike" Gerhard was dead. I don't recall if the park service published this account in their 2002 visitors guide, but redundant or not, it's stark reminder to treat the desert with the utmost respect.